this is the first process i did of this photograph . when i tried to put it in dpc as a print i realised the working file was much too small to get anything other than an A4 print ... i had to totally reprocess it for the print ... i reckon the resulting image is a bit better ..
this is the reprocessed version .. Very nice shot ... the DOF is just right and the composition is excellent. This is just such fun that I guess I should favorite it, huh? this is a great image roz - love the expressions and the title! Nice foto with one in the forefront and 2in the back..
Roz, clearly I have not explored your portfolio enough - this is a most fabulous shot!!! 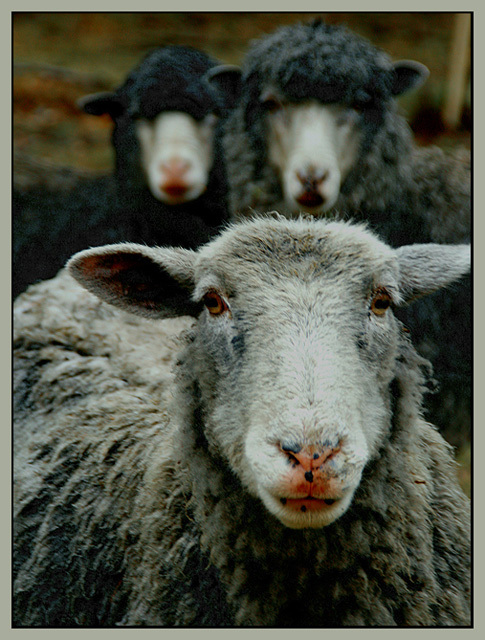 I just love the crop and those three sheep - like they are trying so hard to say something. It's fantastic - processing and everything. Great shot and neat texture in the wool. I'm not sure why they're "idiots" though. What a great shot.. good one Roz. Hehe..excellent! Haven't sheep got the weirdest eye's? What a delightfully quirky shot! Wow, they all have different expressions/looks. Neat, and very well shot and edited. Proudly hosted by Sargasso Networks. Current Server Time: 04/26/2019 02:32:42 AM EDT.